A home is a safe and secure structure that protects us from the things we cannot control, like the weather and intruders. To most, a home’s essential purpose is to provide a stable and safe location for raising a family. Animals build homes for very similar reasons to our own – but they have been doing it for much longer. Their homes are built with great complexity, usually with found materials, but sometimes with materials made from their own bodies. While we marvel at the perfect orb of a spider’s web or the soft lichen-covered cup of a hummingbird’s nest, we realise that these structures frequently exceed the capacities of human engineered materials. Animal home building is all around us – and yet is often overlooked as an intriguing aspect of the natural world and animal behaviour. This three-part series peers deep into the lives of animal homebuilders across the globe in a variety of habitats, to explore the fascinating world of animal architecture and home life. Ecologist Chris Morgan is hosting the show and acts, in part, as our animal real estate agent, evaluating animal homes, their material, location, neighbourhood and aesthetics. 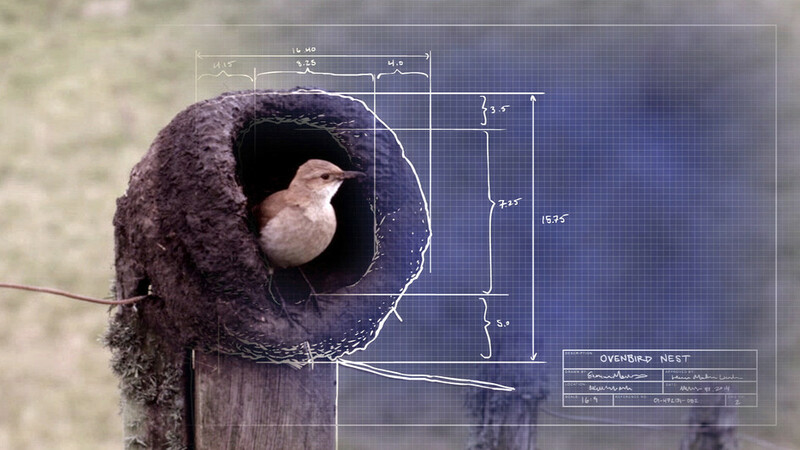 With the help of CGI and graphical overlays we highlight engineering principles of animal homes, while Chris Morgan tries to construct a nest in a specially created warehouse setting. We investigate how skillful and diverse animal engineering and architecture can be, and explore the intriguing behaviours and social interactions that take place in and around animal homes. This episode investigates colonial homes in which animals live in dense concentrations – and where millions of individuals struggle to make a living. Chris Morgan visits “Puffin City” – a colony of 40,000 these charismatic sea birds on the Hebrides islands, off the coast of Scotland. Chris explores what’s going on in the Puffins’ underground burrows – and why these birds are forming such huge communities. One explanation is the widespread strategy of safety in numbers. Potential prey animals can work together for protection – but so can predators. Ecuador’s jungle houses a spider of the social Anelosimus group, that combines forces to hunt – and colonies include up to 10,000 spiders, with dense veils of sticky webbing draping down through the jungle trees. Meanwhile, Australian skinks use their elaborately designed tunnel homes with as many as 20 entrances as a retreat from the burning sun. Gopher tortoises build their residences underground – and will soon have company: to find shelter against forest fires, rattlesnakes and rabbits, frogs and mice are relying on the tortoise and its underground homes. By sending tiny cameras into this remarkable compound, we experience a world unseen before. New science, a fresh understanding and breakthrough technologies allow us to look into this most intimate aspect of animal lives – their home. The result is an original series that takes the viewer on an inspiring journey into a world often overlooked, and break new ground as we highlight new scientific discoveries in the fields of animal behaviour, animal cognition and evolution. Flexible boroscopes and special cameras give us unprecedented views inside animal homes – without disturbing natural behaviour. Time lapse and slow motion images reveal new details, and tiny HD cameras capture intimate, never before seen footage directly in the heart of the animals’ homes. Even more, a blend of satellite imagery, CGI and 3D animation helps getting new insights into locations, nests and burrows, and illustrates them in an informative manner.